International leaders who study and care for people who’ve lost their ability to speak recently gathered at UCF to discuss new therapy that can profoundly improve a client’s quality of life. Some 140 researchers and practitioners from across the United States and Canada came to discuss ways to serve individuals who have aphasia, a condition caused by a stroke or brain injury that affects two million Americans. Their focus was the “life-participation approach to aphasia” to help clients regain their speech and meet their personal needs and goals. AphasiaAccess, a Moorestown, N.J.-based nonprofit that promotes the approach, sponsored the 2017 Leadership Summit March 17-18 at FAIRWINDS Alumni Center. “The life-participation approach is a paradigm shift in how we think about the kind of life a person with aphasia can have,” said AphasiaAccess President Kathryn Shelley. She learned of the approach after her father had a stroke and she was desperate to find a way to help him. 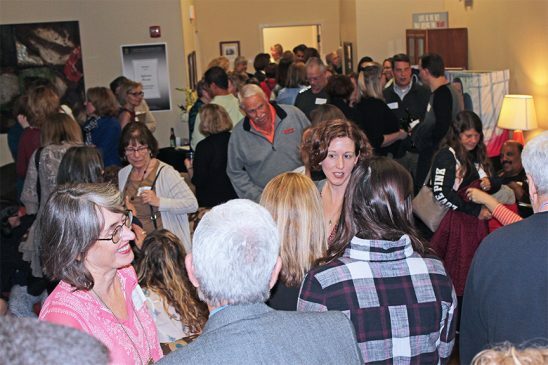 Aphasia House was a perfect setting for the summit’s welcome reception March 16. 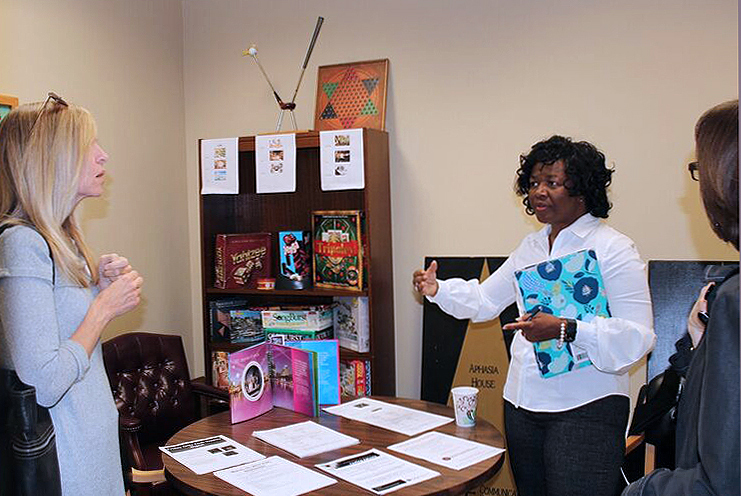 The Central Florida Research Park facility offers therapy for clients with aphasia in a setting that simulates a home. Clients participate in therapy sessions in a comfortable living room, a spacious kitchen and thematically decorated rooms that evoke times in their lives and encourage communication. For many of the summit participants it was the first opportunity to see Aphasia House in person. “From the moment I walked in the front door, I was greeted with warmth and immediately recognized that the ‘house’ was welcoming, comfortable and perfectly appropriate for people with aphasia,” said Abbe Simon, a speech-language pathologist with Triangle Aphasia Project, a nonprofit in Cary, N.C. The summit participants also had an opportunity to meet Mark McEwen, a well-known CBS reporter who had a stroke and acquired aphasia in 2005. McEwen went through extensive speech, physical and occupational therapy to regain his speech and life. In recent years he’s spoken to clients at Aphasia House. The reception launched two days of keynote presentations, breakout gatherings and poster sessions. Among the keynote topics were service operations and evaluation, client motivation in therapy, and using the media to influence communities. 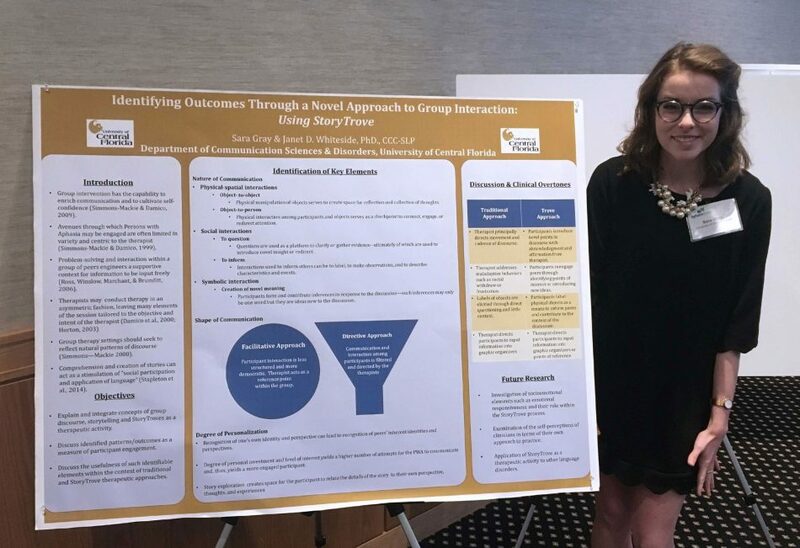 Seventeen roundtable discussions, 16 “share and care” sessions, and 39 poster presentations offered forums for the participants to present and learn about the latest strategies and activities that support life-participation therapy. The schedule was effectively packed with content, but it also provided space for participants to build friendships and just be together, Shelley said.